Create lustrous metal bookmarks that pop out with every read. 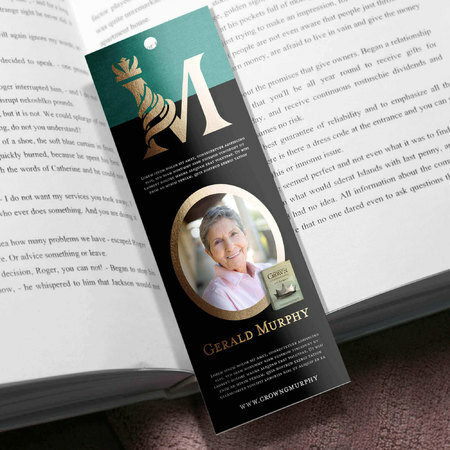 Print metallic bookmarks and become a staple in your customer's reading experience. Give these away at a book launch, signing, book sale or trade show. What Is the Advantage of Metallic Bookmark Printing? Metallic bookmark printing applies a silver foil layer on a variety of colors. The result is a shiny, metallic finish that highlights neutral hues and makes bright colors even bolder. You can apply that lustrous glimmer on one or both sides of the bookmark. What Is the Most Popular Size for Bookmarks? 2" x 6" is the go-to choice for many custom bookmarks, with a long length that sticks out of even the biggest book. You can also opt for the slightly smaller 2" x 4" or a 2" x 3.5" for a more compact design. What Material Is Used for Metallic Bookmark Printing? All metal bookmarks are printed on 16 pt. cardstock. Its thick, substantial weight lasts for the long-term, which gives your brand constant exposure in every read. Choose between a protective high-gloss UV finish or an elegant uncoated surface. High-gloss UV is suitable for image-heavy designs, while an uncoated bookmark is recommended for a rustic, classic look. All orders come with 1/8" hole drilling at the top center. Strings are not included. How Will Spot UV Printing Help My Design? Spot UV printing is available on the front side of your custom bookmarks. A shiny, high-gloss coating is applied to specific areas of your design. You can utilize its smooth, glossy appearance to highlight other details in your design such as a logo or important contact information. Its smooth appearance distinguishes the glimmer from the metallic bookmark printing. How Should I Design the Metallic Bookmarks? Stick to sans serif fonts for easy readability. Don't go below a 12 pt. font size. Apply the metallic accent on lighter colors that appear pale or neutral when printed like normal. Complement the light, metallic hues with spot UV printing on the darker shades. Unsure how to get started? Download any of our available templates to guide you through the design process. You can also check out this helpful post on creating unforgettable promotional bookmarks. How should I submit the design file for metal bookmark printing? To print metal bookmarks, you need to submit two files: the standard CMYK file and the silver foil mask file. The mask file will show where we should apply the metallic printing. Apply 100% K or black on the metallic area then mark the non-metallic areas in white. What are the submission guidelines for spot UV printing? Submit a spot UV template file along with the regular color file. The former will show in which areas the spot UV printing will be applied. Similar to the foil file, mark the spot UV areas with 100% K and color the other sections in white. Is hole drilling included in the order? Hole drilling is an optional feature and can be included in your order. By default, the hole is placed at the top center. Strings are not included. It takes 6 business days to produce a metal bookmarks order.